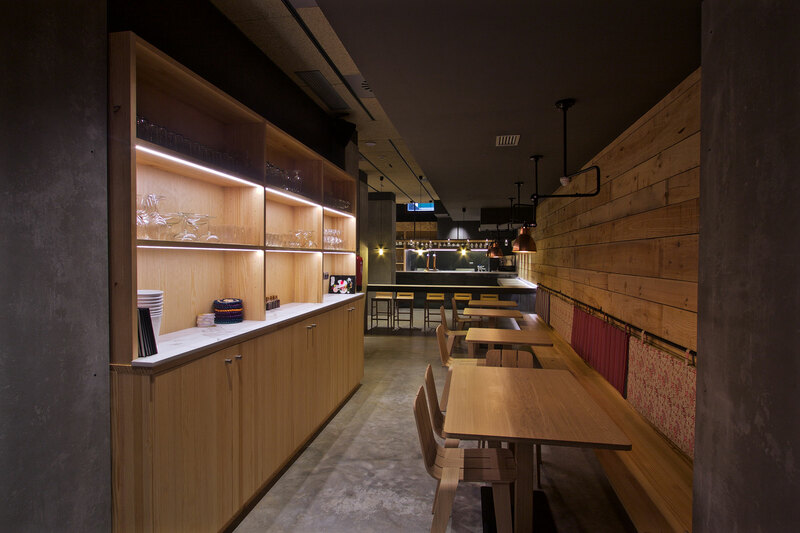 TOPA Sukaldería is a restaurant which highlights the centuries of history uniting the Basque and Latin American people. It’s the meeting point of these two gastronomic traditions, where products, avours, recipes, history, and customs are shared in the common pursuit of enjoyment, discovery and having a good time. The restaurant is inspired by the trips Andoni Luis Aduriz and his team have taken over the years to various Latin American countries. Construction Company Construcciones HUGAR, S.L. Application Kitchen Worktops, Counters, Furniture Surfacing and Wall Cladding. 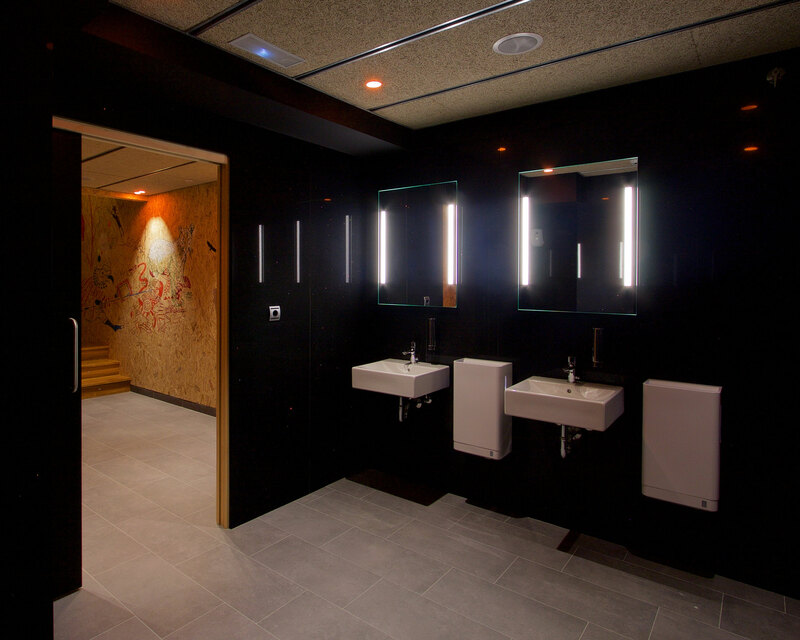 TOPA Sukaldería is located in the heart of the Gros district of San Sebastián, and occupies a total space of 496 m2, divided over two floors. The ground floor is occupied by the kitchen and the dining lounge, while the bathrooms are located in the basement. 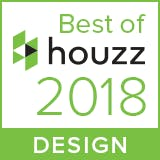 Clarity of space, contrasts, an upbeat, cosy environment, myriad ways of welcoming customers, high-quality decorative and architectural products, and the use of recycled materials are just some of the key concepts that de ne this project. 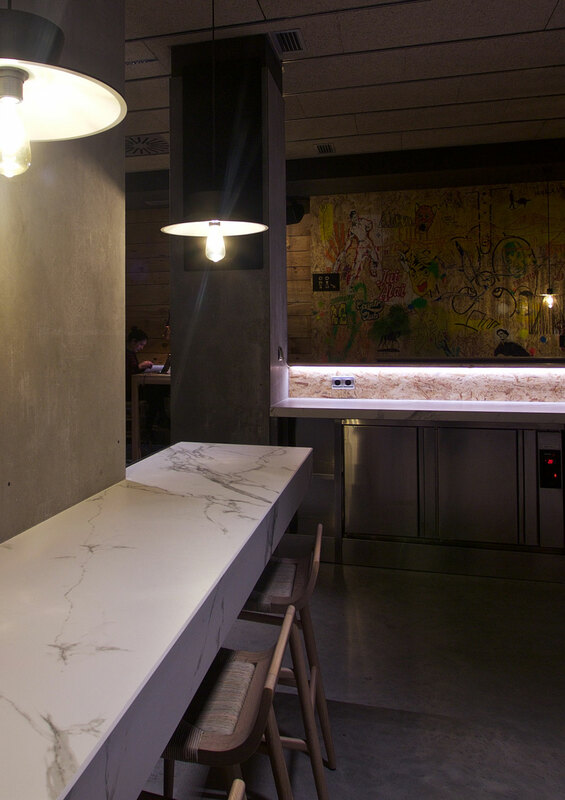 The ultra-compact surface Dekton® by Cosentino, and the ecological Silestone® Eco Line range were chosen for this design. 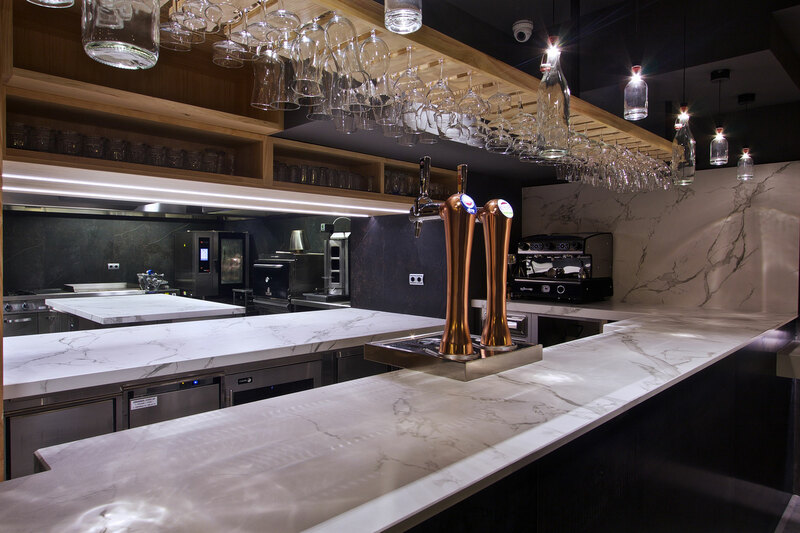 More than 400 m2 of Cosentino products were used in this inspirational culinary project. The spectacular kitchen and dining lounge are located on the ground floor. In this large space, the emphasis is on the visual contrast between the natural, marbled finishes of the Dekton® Kelya and Dekton® Aura tones, and the wooden planks and metallic textures that permeate the entire room. 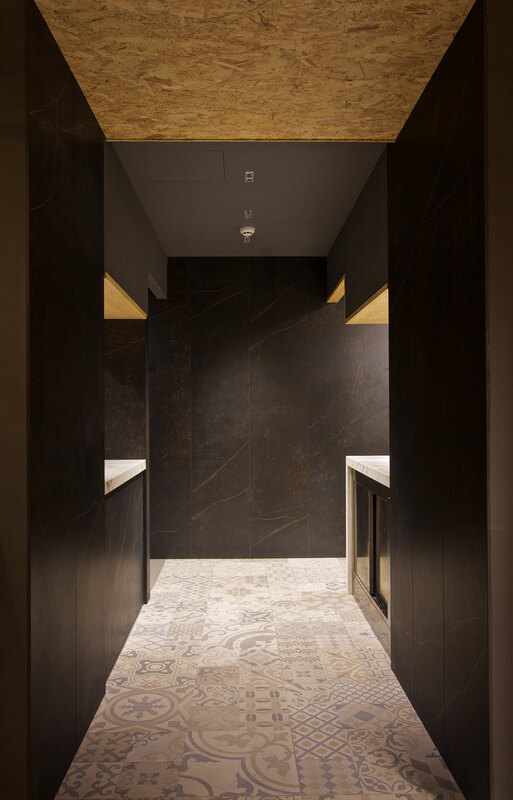 One of the priorities of this design was to harness the concept of an open kitchen, to allow customers and diners to see the chefs’ creative process first-hand. The Dekton® Aura worktops and counters connect the kitchen with the rest of the room in an elegant harmony. Their wonderful pure white clarity, together with their distinctive veins, make them the room’s stand-out feature. The safety and hygiene o offered by Dekton® when handling food, its high tolerance for both heat and cold without suffering aesthetic or structural changes, its high resistance to stains and scratching, and the availability of large format cut to size were determining factors in the choice of Dekton® surfacing. Furthermore, Dekton® Aura was used as counter for the furniture located throughout the dining room, bringing greater visual harmony to the space as a whole. 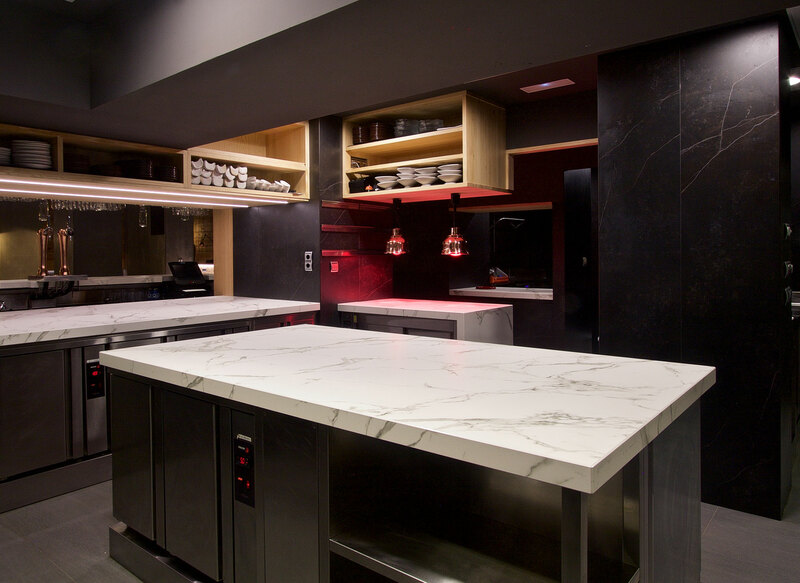 The contrast between the stainless steel, which can be seen in abundance throughout the kitchen, and the deep, dark, matte finish colour of Dekton® Kelya, is quite simply magnificent. In addition to the beauty and outstanding technical bene ts of Dekton®, the option of installing large format slabs for the kitchen walls, with minimal visible joints, gives the space a greater sense of continuity and aesthetic elegance. "THE STRENGTH AND UNMATCHED BEAUTY OF DEKTON® ULTRA COMPACT SURFACING ARE TWO KEY FEATURES THAT MAKE IT THE IDEAL PRODUCT FOR PROFESSIONAL KITCHENS"
For the sake of contrast, elegance and functionality, the Starlight colour from the Silestone® Eco Line was used for the wall cladding in the bathrooms. This material was chosen in line with the use of recycled wood shavings for the ceilings and other cladding within the premises. 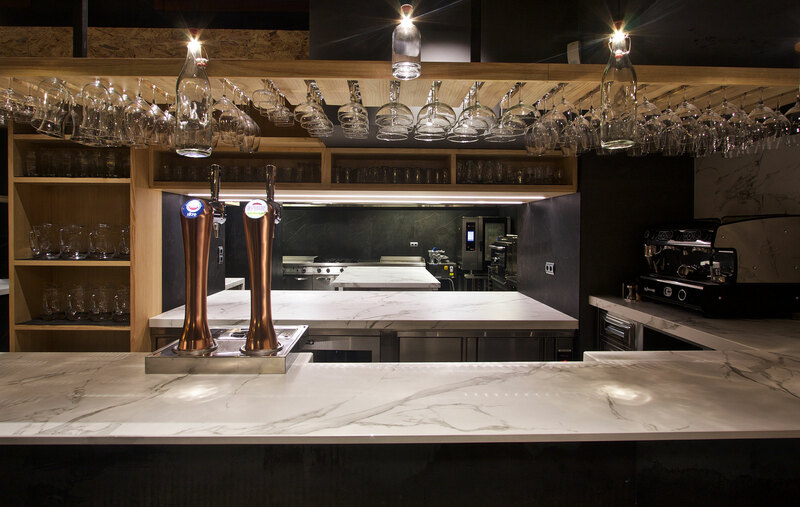 "THE SILESTONE® ECO LINE COLLECTION USES NATURAL RESOURCES IN A RATIONAL, EFFICIENT WAY. 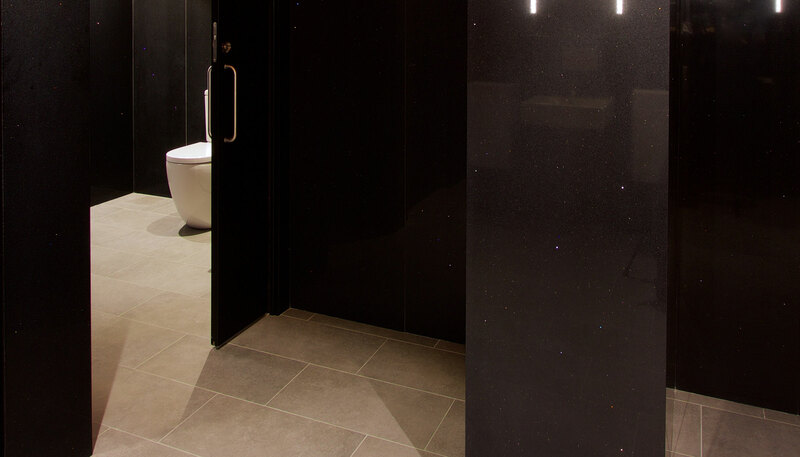 ITS COLOURS ARE MANUFACTURED USING A MINIMUM OF 50% RECYCLED MATERIALS"
The emphatic black colour of Starlight provides the perfect contrast to the white of the bathroom elements and the grey shades of the flooring. 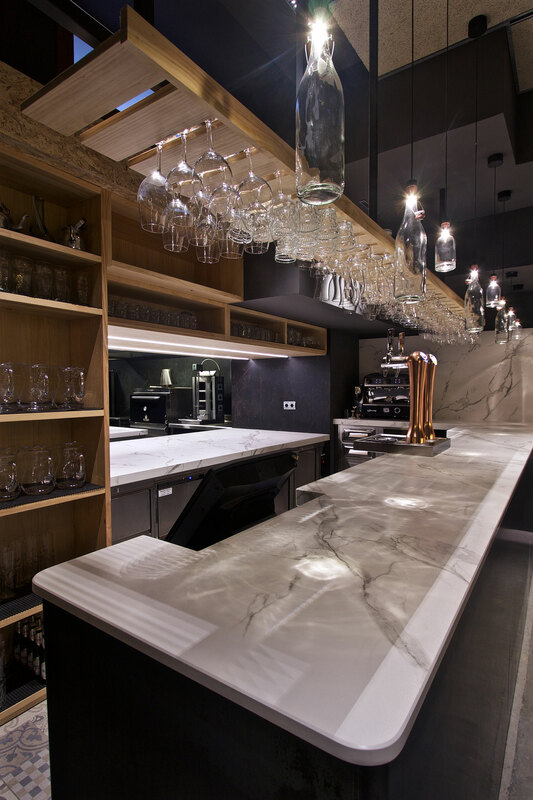 The scintillating gleam of the mirror shards which are incorporated into slabs of Silestone® Eco Line balances the light and the darkness in the room, and creates an unexpectedly bewitching visual effect. The large format of the Silestone® Eco Line units used for the walls greatly reduces the number of joints in the final design. An impression of spotlessness, aesthetic continuity and perfect unity is guaranteed. 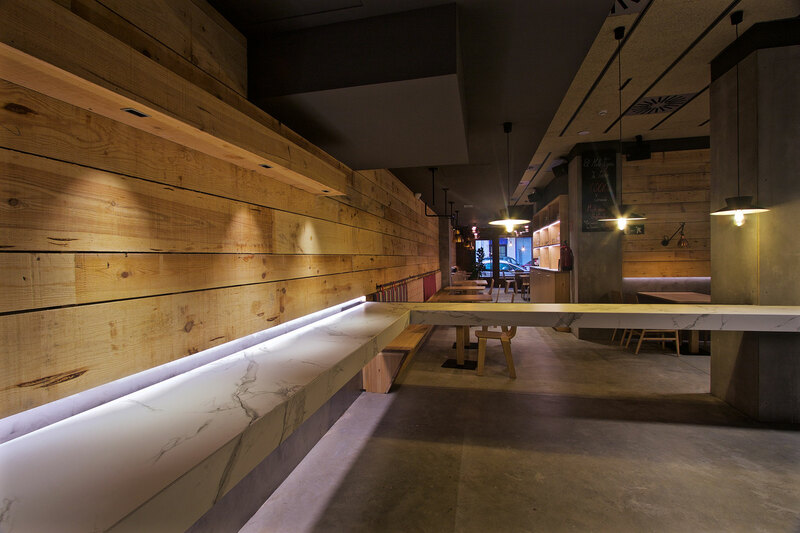 Eco Line, as a collection of Silestone® quartz surfaces, is ultra-resistant to stains, impact and scratching, has low liquid absorption and can be manufactured in large format slabs (up to 3,25 x 1,59 m). 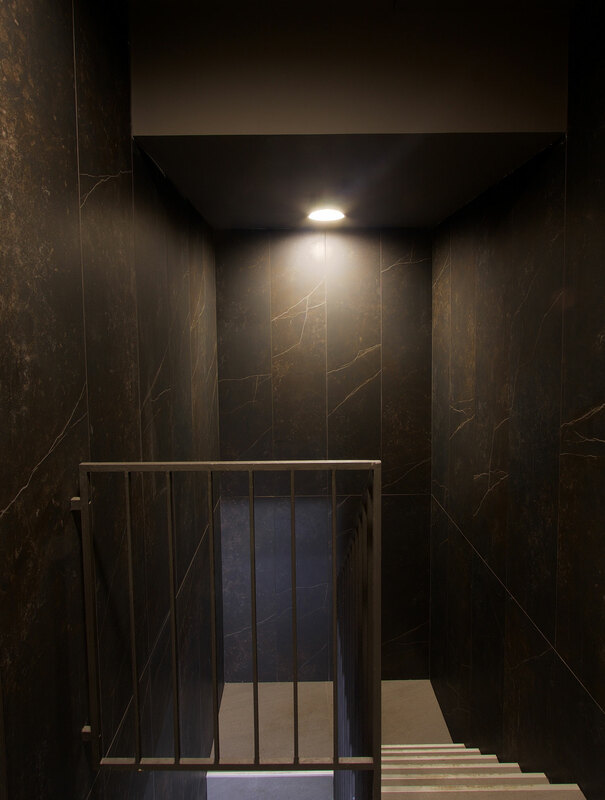 Allowing for easy cleaning and daily maintenance, it guarantees a level of hygiene essential for any bathroom, or for use in any project with these characteristics.